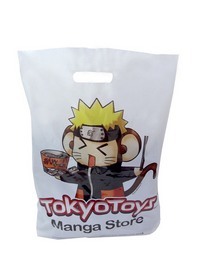 Printed Carrier Bags at fantastic discount prices! Here at Discount Printed Carrier Bags the clue is in the name. We specialise in providing printed carrier bags - personalised with your own company logo or design - at fantastic discount prices. Our printed carrier bags start from as little as 4p a bag and we can give you a quote in less than 60 seconds with our instant quote wizard - it's incredibly simple to use and will provide you with a quote on your very own personalised carriers in under a minute. We love to keep things simple, fast and cheap. We've streamlined our service so that you don't have to wait and so that you can take advantage of wholesale prices with top quality products and first class service. All of our printed carrier bags are patch handle carriers - the classic carrier with a reinforced handle for extra bag strength. They are available in just our five most popular sizes - mini, small, standard, premium and large - and in either white, clear or coloured polythene. No mess. No fuss. Our minimum order is just 1,000 for most printed carriers, which makes them an affordable option for businesses beyond the traditional retail sector. 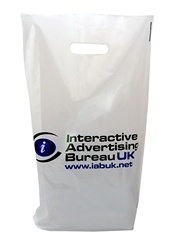 Ideal for appearances at conferences or trade shows, a small order of carrier bags dedicated to an event can boost your company's profile where it's needed, without breaking the bank or leaving you with boxes of unwanted bags. Whilst our bags are cheap, we don't compromise on quality. All of our carrier bags are made from polythene with a thickness of 55 microns - 10% thicker than standard carrier bags (50 microns). This extra five microns may not sound much, but it provides a more glossy, more silky and more substantial bag to the touch; when combined with your personalised design this will guarantee your bags look the part and help your organisation stand out from the crowd! Discount Printed Carrier Bags is brought to you by Polybags Ltd - the UK's number one manufacturer of carrier bags and other polythene packaging - to showcase their printed carrier bag service, which provides bespoke carrier bags at heavily discounted prices. Polybags specialises in producing first class polythene products at competitive prices with high and low print-runs. Because Polybags is a manufacturer we can always offer direct wholesale prices, cutting out the markup that other merchants have to apply. 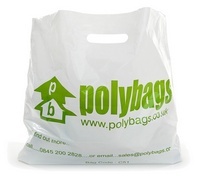 Orders placed with Discount Printed Carrier Bags are fulfilled directly by Polybags' first class service team with no commission or additional costs added. If you're looking for carriers but don't need to design your own, then Polybags' huge range of off-the-shelf carrier bags should cater for your needs, with a massive selection of clear or coloured carriers available in plain or ready-printed designs at fantastic discount prices. This includes everything from your everyday supermarket crinkly carrier bag - one of many from the popular economy range - to top-of-the-range shopping bags with clip-close fasteners. 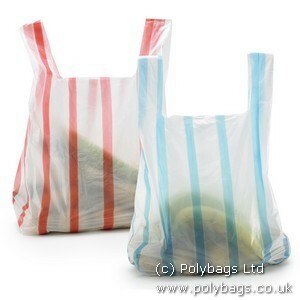 Whatever your budget, whatever your business, whatever your customer base and whatever your favourite colour, Polybags' has a carrier bag for you, from a cheap and cheerful plain white vest carrier to a luxury fashion carrier that shows your clientele that you mean business. 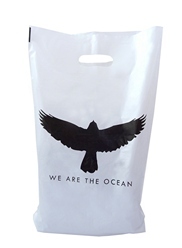 But if you really want to stand out from the crowd, then there's only one type of carrier bag for you. That is one that tells your customers who you are and tells everyone they see all about you... that's right, the printed carried bag! Let your customers advertise for you! 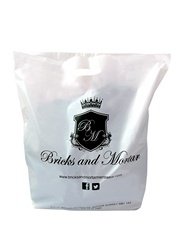 Printed carrier bags allow your customers to provide mobile advertising for your business. 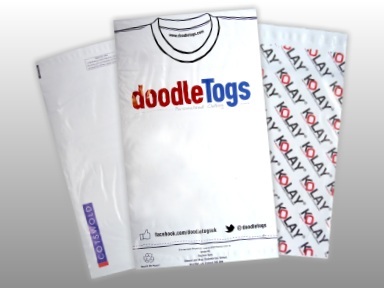 Print your company logo or design on the side of a carrier bag and spread the word about your business, right at the heart of where you need it most - among other potential customers! Whether on the high street or shopping centre, or even at a conference or trade show, printed carrier bags show that your company means business, they reinforce your branding and show that you have a professional edge - with your own customers and everyone else who sees your bags being carried around. With prices from as little 4p a bag, getting your own printed carriers doesn't have to break the bank, so why not spend that little bit more and get Discount Printed Carrier Bags to produce your quality carrier bags at wholesale prices - no hidden costs, no middle-man, buy direct from the manufacturer and save money. We can give you an online quote in less than 60 seconds, so there's no need to wait around. 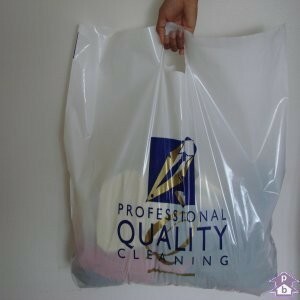 Place your order and we'll produce your functional shopping bag and marketing tool rolled into one at a discount price. Once that's done, all there is left to do is let your brand do the talking and let your customers show your business to the world! 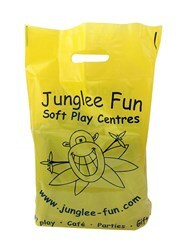 If you provide one customer with a plain, unremarkable carrier bag and then you provide the next customer with the same carrier bag, only this time it's printed with a smart and snazzy design, representing your company on the sides of the bag, which of the two customers is most likely to remember the bag? The answer of course is the second one! Not only is the bag more likely to stand out in their memory but, if the customer has received a positive shopping experience when they first received the bag, the chances are they will then associate the bag with a positive recollection of your company. This itself means that the customer is more likely to re-use your printed bag, compared to an ordinary plain carrier bag or a bag associated with a less positive experience which, in turn, means the chances of your printed carrier bag getting repeat trips to the shop are increased, thus advertising your company once again within its target market.